Major demolition work began on the old Walterdale Bridge with the removal of the north truss on October 24. The truss was lifted by crane and set onto the north in-river berm for dismantling. The south truss was removed on October 30 and placed on the south laydown area for dismantling. Bridge demolition is expected to be completed in late 2017. The Walterdale Bridge opened to traffic with two lanes available on September 18. All three lanes and the west sidewalk were open on September 29. The new shared-use path on the east side of the bridge will open later this fall. In April, 25 pieces of the shared-use path began arriving on site in 11 segments and were installed as they arrived. Installation was completed in mid-May and crews are now welding the sections in place. Deck and railing work will follow. On the main bridge, work continues on deck waterproofing in preparation for paving this summer. 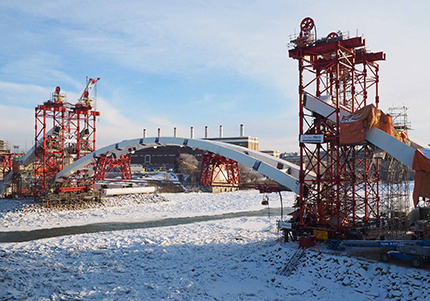 2016 was a big year for the Walterdale Bridge Replacement Project, as the bridge finally came together across the North Saskatchewan River through two massive arch lifts in January and April, followed by deck steel and concrete work. Learn more about the milestones reached in the 2016 Yearbook. Concrete deck pours are complete. Crews spent the fall completing deck form work, installing reinforcing steel, and pouring approximately 2,000 square metres of concrete. The final deck waterproofing and paving were not completed due to winter weather. This work will be completed in the spring. Work on the shared-use path continues in the west end. Several key milestones have been reached on the Walterdale Bridge construction over the last couple of months. The bridge deck structure was completed and the 32 support hangers were put in place by mid-September. Off-site assembly of the Shared Use Path has also started. When it’s ready to be hung, the path will be shipped in segments to the bridge site. While significant progress has been achieved to date, the remaining work must be completed in a specific sequence which will depend heavily on favourable weather conditions for the remainder of our short construction season. The completion of the suspension-based construction and concrete pours has pushed the timing for paving into colder weather where it may not be possible. The City expects that remaining work on the Walterdale Bridge will not be completed in time to open the bridge to traffic in 2016. The old Walterdale Bridge will remain in service until the new bridge opens to traffic next year, so traffic will not be impacted by this schedule change. This delay is very disappointing, but the City’s contract management processes have ensured that the City and taxpayers are protected in terms of cost implications. All costs for the delay are borne by the contractor. As you can see from the Livestream Camera, we’re making great progress on the construction of the bridge deck. Of the 21 steel sections that will make up the deck, 13 have been built to date. Currently the deck is resting on temporary supports, but very soon it will be attached to the hangers which will provide the permanent support. As the bridge deck construction continues, you’ll see the assembly of two large 100 metre tall cranes which will stretch out across the river for the completion of the centre portion of the deck. Of the 32 bridge cables, or hangers, that will support the bridge deck, five have been put up so far. There will also be 14 hangers for the shared-use path (SUP). All of the steel for the path is in Edmonton being assembled at an off-site location. The SUP is up to nine metres wide at the ends and 4.2 metres wide in the centre, and will be trucked to the bridge site in large sections after the bridge deck is completed. 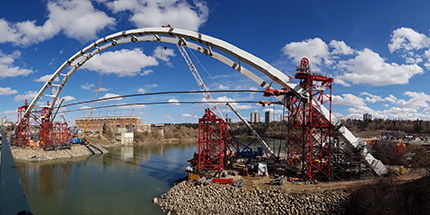 The second and final arch lift on the new Walterdale Bridge took place on April 12, 2016 with great success. The 2,000 tonne signature bridge arch was raised about 20 metres to its ultimate height of 54 metres above the river. Now work has started making the connections between the segments. After that we'll be building the bridge deck! The latest update on the Walterdale Bridge Replacement project including pictures of the January 19 arch lift and the upcoming construction timeline. The first of two major arch lifts took place on Tuesday, January 19. The 950 tonne central arch, which was floated into place last November, was lifted about 15 metres to connect with the two arch sections already resting on the berms. The lift process took about six hours and a second major lift is scheduled for March. You can watch the bridge construction on our live feed cameras. Preparations for floating the 950-tonne steel arches across the river continue. View the new live construction streaming video to see the ongoing progress. October 21, 2015 - All arch steel is now on site, and the central arch segments have been assembled on the south side of the bank. The bridge contractor has completed dredging the North Saskatchewan River, and preparations for the arch float are beginning. Preparation has begun for the arrival of the steel arches in the fall of 2015. In order to allow for them to be floated across the North Saskatchewan, the river needed to be dredged to at least 2.1m deep. This process will not only provided the access needed but it will also provide the project with material for the build as the extracted river bottom will be used as backfill for Queen Elizabeth Park. Work continues on the concrete bridge support legs that will connect with the arches with the underground thrust blocks. The central sections of arch steel are on site and work will now begin on assembling the pieces in preparation to have them floated across the river. In early April, the City of Edmonton had announced that the anticipated traffic opening date needed to be revised to fall 2016. With the arrival of the central steel pieces, the construction schedule has also been updated. More details can be found in the April update of the project. On April 8, the City announced that the scheduled opening date for the new Walterdale Bridge has been pushed back a year, from fall 2015 to fall 2016. More information about the current progress of the Walterdale Bridge can be found in our updated FAQ document. The Walterdale Bridge team is finishing work on thrust blocks and arch support structures in anticipation of arch steel arriving in March. Get more on the Walterdale Bridge Replacement Project in our February update. Work continues on concrete foundations for tracks in the laydown area. Cofferdam excavations are being backfilled. Concrete work continues on the thrust blocks. In late August, in-river berms were extended to create launch areas for future bridge arches. Temporary steel towers are being created and will be placed on the in-river berms to lift the arches into place. Crews began extending the in-river berms, which will serve as launching areas for the bridge arches. Work on thrust blocks also continued on both sides of the river, with crews layering concrete over anchor rods to form the four thrust blocks that will support the new bridge arches. Crews are continuing with the foundation work on both sides of the river and will be starting on preparation for the future shared-use path and promenade wall just northwest of the existing bridge. In early August crews will begin expanding the existing in-river berms, which will serve as launching areas for the bridge arches. The Walterdale Hill Road was closed in early May to allow for the necessary road realignment. In addition, decorative streetlights have been installed along Queen Elizabeth Park Road that are unique to this project. Thrust block construction has begun in all four cofferdams on both sides of the river. Once completed, this essential work will be hidden 20 m underneath the ground and future roadway alignment. Work on the north bridge abutment is also underway. Work continues on the project with several important milestones having been reached in January. In addition, the City has launched an infographic detailing the substructure which will be the foundation for the new bridge. See how construction on the new Walterdale Bridge progressed over the past year in the 2013 yearbook. Crews are excavating within the south side cofferdams for thrust blocks that will support future bridge arches. Major grading work on Queen Elizabeth Park Road (QE Park Rd) is complete. Minor boulevard grading ongoing. Base asphalt, curb and gutter work is 50% complete. Signs, pavement markings, temporary trafﬁc signals to be installed after paving completed. Drainage on south side along QE Park Road complete. Drainage on south side along QE Park Rd complete. Sheet piling installation continues on both banks, including 40 sheet pilings on south side and 9 drilled concrete piles on north side. Queen Elizabeth Park Road to reopen to trafﬁc by early October. Drainage work and utility relocations underway. Drilling and sheet piling work underway on south side of river in preparation for thrust block construction. In-river berm construction was completed in March 2013. Construction is anticipated to begin in late June/early July. Queen Elizabeth Park Road will be closed once construction begins. The City will send out traffic advisories and a media announcement prior to the road closure. The Walterdale Bridge will remain open to traffic during construction.